Unsuck DC Metro: Does One Get Written Up for this? 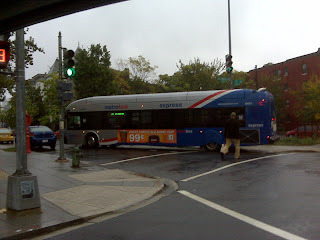 Here's a photo of an empty S9 Express Bus STUCK at 15th and Columbia Road, NW. Anyway, when you look at the photo, you'll notice that there are no cars around it. Why? Because there is no traffic. As this Metrobus attempted to make a right turn at this narrow intersection, they were very unsuccessful, and the bus ended way up on the sidewalk, wedged up against cars on both sides and the traffic light/street light pole. Courtesy of this one S9 Metrobus, traffic on 15th Street, Columbia Road, and Girard Street was all backed up this morning, adding a nice 15-minute delay to many of our mornings. 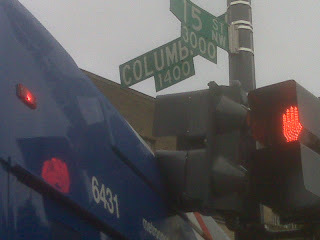 As we know, the S9 runs up 16th - so why it was attempting to turn off of Columbia Road, I just don't know. I wonder if this ill-advised turn is part of Ms. Jeter's latest pledge? 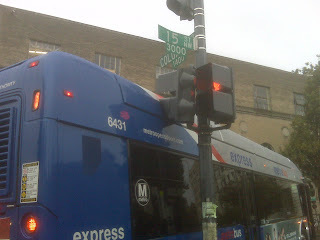 There's lots of other ways to get to 16th Street -- why did the bus have to try make THIS turn at this narrow intersection? I wonder if there's a rule about that? What say you Metro? ATU Local 689? Not sure how long [this bus] had been there, but it was blocking traffic on 15th. Then a cop that was dispatched to direct traffic blocked one lane on Columbia with his car. Not sure why. Maybe so the drivers on Columbia Rd would suffer as much as those on 15th. "Why" was a bus making a turn there!?! Seems Metro--or its operators--are making turns onto and/or using streets that they've never used before. I.E. buses never used 15th Street, NW or Florida Avenue, NW*. So, "why" was an S-9 anywhere other than on 16th Street? what's that bus even DOING there? "Seems Metro--or its operators--are making turns onto and/or using streets that they've never used before." This is wrong. The H8 makes that exact turn (going west on Columbia, turning right onto 15th St.) It's actually a pretty tough turn to make when there's traffic - the bus has to go into the left lane and then turn right across the right lane in order to make it and avoid hitting the car that's parked in that photo. 2) It may turn for all of a 1.5 blocks; but buses d not run on the rest of 15th.